Many packages in a varied range of prices are available from Alamo Sightseeing Tours. Click here for more specifics, prices and booking information. 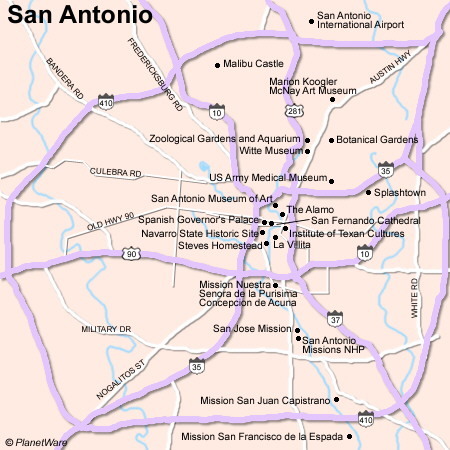 Other helpful sites are Visit San Antonio and Trip Advisor. Possibilities include - The Alamo - Riverboat Ride - Mission Concepcion - Mission San Jose - Japanese Sunken Garden Buckhorn Saloon and Museum - Texas Ranger Museum - El Mercado - Hill Country Tour - Wine Tour - Alamo Trolley - Briscoe Western Art Museum - Comnanche park - Fiesta Texas - Golf at Brackenridge - Louis Tassauds Wax Works - Majesctic Theatre - Meet at mexican manhattan - Pearl Parkway - Ripley's Believe It or Not - Sea World - Spanish Governor's Palace - Tobin Center.